Survivor: Caramoan - Fans vs. Favorites (2013) - 14th place, 7th out. Voted out in Episode 6, "Operation Thunderdome" (Day 16). Caramoan Ep. 1 RC: "Water Slaughter" - With Laura, loses the point to Cochran & Francesca; Gota eventually loses. Caramoan Ep. 1 RC: "A Long Way to the Top" - With Julia, tosses crates down from the third floor, and after Reynold tosses sandbags, Gota wins. Caramoan Ep. 2 RC/IC: "Plunge, Pull & Pop" - One of three pullers, Gota loses. Caramoan Ep. 3 RC/IC: "Cell Block Sea" - Once again, Gota loses. Caramoan Ep. 4 RC: "Head and Shoulders" - One of the platform holders for Gota, which barely loses. Caramoan Ep. 4 IC: "Smash & Grab" - Breaks tiles for Gota, which loses, once again. Caramoan Ep. 5 RC: "Nut Bucket" - Holds up one of Gota's baskets, and Gota loses. Caramoan Ep. 6 IC: "Crate Outdoors" - Now switched to the new Bikal, which promptly loses big. Caramoan, Ep. 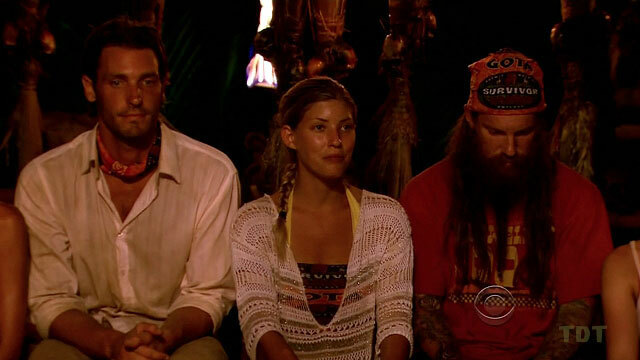 6: Four votes, from Dawn, Cochran, Corinne, and Phillip (voted out, 4-2-1). Time to switch - how d'ya like them eggs? Yes! We placed one crate! Rob Cesternino at RobHasAPodcast (3/21/13): "Talking With the Latest Player Voted Off of Survivor"
Gordon Holmes at XfinityTV.com (3/21/13): "Matt: 'I Wish I Had a Sweet Name Like 'The Beardinator''"
Daniel Fienberg at HitFix.com (3/23/13): "Matt Bischoff Talks Survivor: Caramoan"
Personal Claim to Fame: I am most proud of being a daddy to my two boys. I do a lot of cool things and have personally achieved a lot, but being a dad is the best by far! Inspiration in Life: Hans Langseth – he grew the longest beard ever at 17.5 feet long. He pretty much rules my life. All hail long beards! Hobbies: Beards, singing in a band and BMX. Pet Peeves: Uptight people with no sense of humor, people at gas stations that hold up the line to buy lotto tickets and cigarettes and bad tippers. 3 Words to Describe You: Funny, over the top and caring. 1) My ipod – I constantly listen to music. It is a huge part of my life. I also would want to view photos of my wife and kids. 2) A pen and notebook - to work on song lyrics and keep a daily diary. 3) A video camera - to film myself doing wild stuff! Survivor Contestant You Are Most Like: Rupert – he has a big heart and loved to play the game. His teddy bear personality and tough looks remind me of myself. Also, Lex - he was a cool guy, a smart, down to earth dude with a band and lots of tattoos. Reason for Being on Survivor: I want to win. I also want to open up people’s minds and show them not to judge a book by its cover. A person’s true character lies within. Why You Think You’ll 'Survive' Survivor: I’ll be able to keep people’s spirits up by making them laugh. I’m a hard worker. I’m highly positive and motivating. I will play a great social game. Plus, I feel like I will do well in challenges. I’m a team player. Anyone in my alliance will make it to the end. Why You Think You Will Be the Sole Survivor: I will play a great social game and people will want to keep me around. I’m confident that people will trust me."